PSB weren’t an easy band to translate into a live setting. More a concept than your average knock-about touring band, their high-concept music won’t appeal much to the indie kids. However PSB have grown as performers, combining wit and experimentation to produce a thoroughly entertaining live set. The staging is dramatic. In keeping with Every Valley‘s focus on the plight of Welsh miners, colliery wheels spin at either end of the stage, dim lanterns descend from the rafters and vivid projections fill the 02 with atmosphere. PSB play a harder set than before. The popular ‘Geoffrey‘ animation that played on their last tour, dissuading unruly use of cameras, is replaced by a more subdued reminder. Opening tracks ‘Every Valley’ and ‘The Pit’, which sound imposing on the album, are even more so here. The foreboding drone of the horns and machine-like beat impart a feeling of being caught up in the gears of something beyond your control. Similar to the eerie floating drones which opened the last Muse tour, it puts the audience in suspense. The story being told cannot mask how comfortable PSB are on stage. From all of them a confidence flows and mingles with the growing enthusiasm of the crowd. Demure frontman J.Wilgoose speaks, something left to computers on the prior tour. All three are visibly animated and actively experiment with the structure and sampling of the songs. This reaches a peak on ‘Go!’, where the response is nothing short of rapturous. 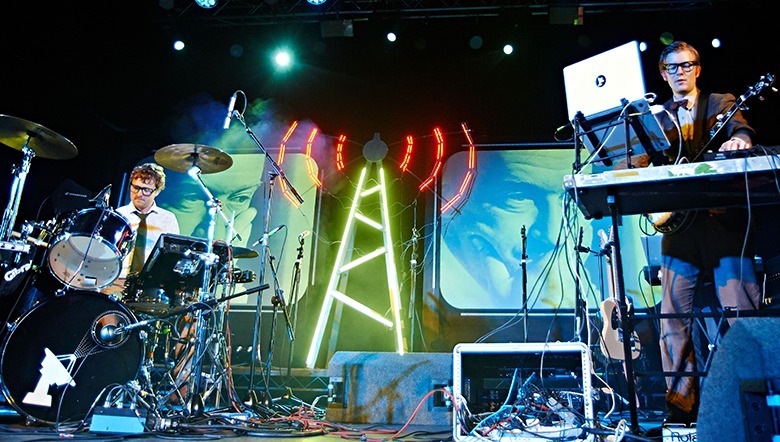 For such an unassuming band, Public Service Broadcasting have proven to be the unlikely showmen, and no one touring today has the passion, imagination and social conscience on show here. PSB are touring throughout October. Read our interview with J. Wilgoose, Esq. here.